Darwin wrote and received over 15,000 letters during his life. His correspondence offers a fantastic way of keeping up with and understanding one of the greatest natural historians in history and an exiting and very complex human being. Darwin was a great thinker, a meticulous scientist, extremely knowledgeable, he read books on various areas, he was a man of morals who detested cruelty towards animals and human beings, he strongly opposed slavery, he was a family man, open, honest and loving to the ones close to him, humorous and kind hearted. You can get a more in depth impression of Darwin’s qualities by exploring his exiting letters. Not all of the material has been published yet but a large amount of the correspondence is already available now online on The Darwin Correspondence Project at the University of Cambridge. 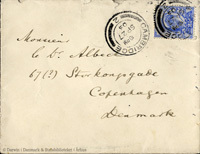 Darwinarkivet cooperates with The Darwin Correspondence Project and has among other things translated the play Re:design which is based on the riveting correspondence between Darwin and the American botanist Asa Gray. The Danish translation has been done by Nanna Kaalund. Theatre groups and theatre enthusiasts are welcome to contact us.